Learning the truth about affiliate marketing can be an true eye opening experience. And people really do want to know. They may have heard how someone made a couple of hundred bucks all the way to millions of dollars. So, they become intrigued, and some even become desperate about learning online marketing. They are filled with promises of get rich quick, and left angry when things don’t work out. Some even attempt multiple times with no luck or have a little success but never enough to make a stable income. On the flip side, there are those who have actually made millions of dollars and had great success. So what gives here? Why do some have success while others have none? Well, first of all as with anything in life there are no guarantees. You could try many things throughout a lifetime and never experience success. Sometimes it’s because you are not doing the right things. And, other times it’s about luck or skill. And affiliate marketing is no different. But, your chances of experiencing success do go up when you understand things and or receive the right training. 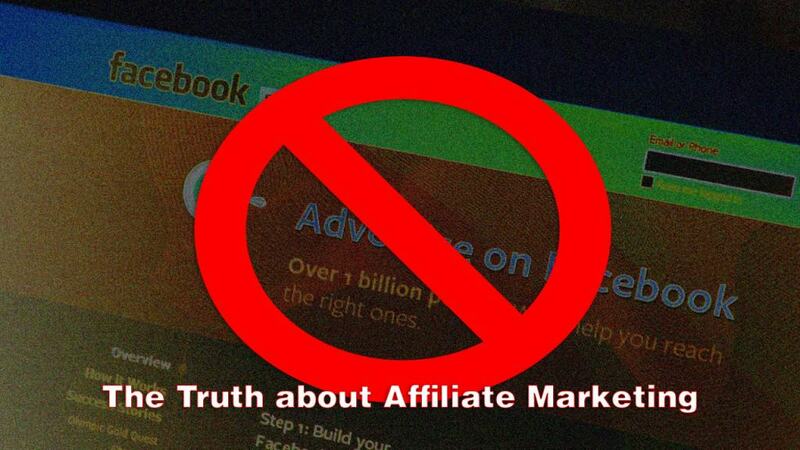 So lets dive in and learn a little about the truth about affiliate marketing. This is a big one many people don’t get or cannot phantom until something happens. Do you know the old saying “Don’t put all your eggs in one basket”? Well, this is one of the biggest mistakes people make with online marketing. Some finally find a way to make tons of money online by one way. And that way could of been Facebook. And then all of a sudden their Facebook ads account is shutdown. Their money train is completely cutoff and their financial life is now a train wreck. If you look at most of the ways you or anyone market’s online, there is usually some big company behind it all. Facebook, Youtube, Google, Twitter & Amazon just to mention a few. These are all big companies who have at one time or another, shut down someones account. And put them out of business. Good size companies have been destroyed literally overnight, and people lost jobs careers and income because of it. Now, we mention this not to scare you away from online marketing or anything like that. But, we want you to understand you will always need a backup plan. This is also why a business plan with a foundation is highly recommenced. And, a business plan could be very simple also. So, this is why we also want to see people have a website and an email list. You are even at the mercy of an email list provider if you use one of these companies. If you get too many spam complaints for email they can and will shut down your account and you will lose access to all your lists and emails. This is also the reason many people build multiple websites and business’s online. This is usually a good idea. Again, do not let this stop you from entering online marketing. Just make sure you build something where you have a plan B in case something happens. Many people see a false ad or stupid claim and think they can get rich overnight. While flukes do happen once in a great while to someone. There was usually some work behind the success story that took place, before the success happened. Look at even america’s CEO’s of top companies, read their backgrounds and you will usually find some story about hard work before any success. Many people need to stop looking for the next best thing also. With affiliate marketing it takes work and dedication. Very rarely does any business success happen overnight. If you have a website and are trying to get traffic from Google. You will need to write a good amount of articles before your traffic really takes off. This is where people get let down all the time. They expect for things to happen way to quickly. You have to put in the work before things pop. Some people have learned by trial and error after years and others get training. While getting certified is all the rage these days. It is not required. But, if you want to improve your chances for success some training could help. A great place to learn how to build a website for an affiliate marketer is Wealthy Affiliate. This is a great place to get some help if you are new to online marketing or trying to become an affiliate marketer. Many people when trying to learn how to market on the internet, do way too much. Or they attempt one traffic source and then move on to another even before they learn the last one they tried. What you need to do is pick one way you will be getting traffic and monetizing. Then focus your efforts within this realm first. For instance, lets say you like to write and really would love to have a high traffic website. Start your website and write articles. Learn all you can about seo and organic traffic generation and producing excellent quality content. This should be enough to keep you busy for a while. You will begin to learn things like why you need to write in your own voice and how to produce quality articles over 800 words. And, how to write inspirational helpful articles. For instance, many people make the mistake of wanting to see the money too fast and write crappy keyword and money driven articles. Their articles are very short and help no one. John Lennon once was asked why the Beatles became so good. And his reply was, “We just wrote music we loved”. So, if you want to create an affiliate income from a website, pick a topic you know well and love and write quality. Then after you have some success with a website, you can figure out other ways to make money as an affiliate online.